It is time for me to clean up our garage. I had fantasised about having a butler to do a few jobs like this and cleaning my shoes but I don’t think we will be getting a butler! Last week I did the laundry cupboard with a friend and it felt wonderful and looks so beautiful now I feel like showing everyone who visits. Stunning Sandra – I had an experience like this the other day. At home I found I had cut off from others in my house. Then I noticed how this was true on a very literal way – all my possessions were boxed away on their own. After an evening of rearranging all these things and placing them with other people’s bits, I found there was a new openness and warmth between us all. It’s like on a deeper level I had chosen to let other people in. Your words here emphasise that our physical surroundings reflect so much but in the end it always comes back to energy and us being open and true deep within. Giving the place where we live and work some loving attention always pays dividends. 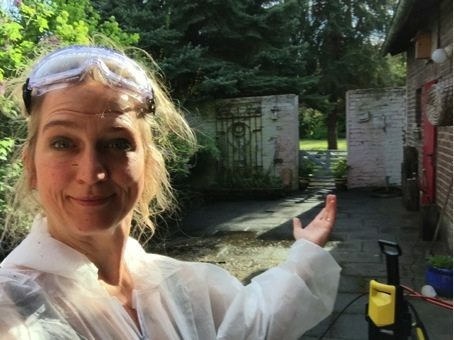 I can relate to this article as recently I had the driveway pressure cleaned as it was very dirty and a lot of moss began growing there, the way it looked and felt after it was cleaned bought a smile to my face and I felt the lightness and spaciousness it bought to the property. It is so true that standing in protection can just make things worse, and sometimes it is the most open and honest way forward that supptrs the best in coming back to love. When we heal and let go of our hurts we clear the space for more of who we are in essence, our love, to emerge. 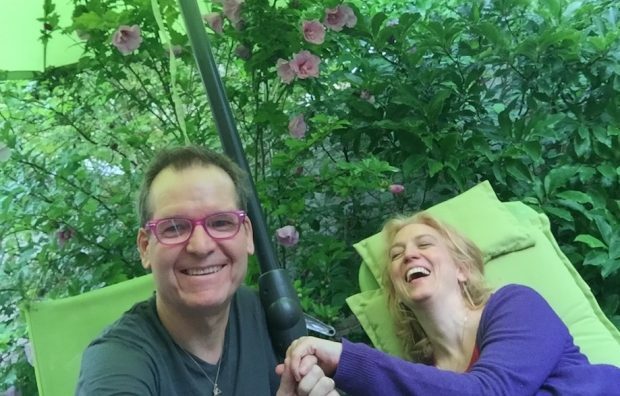 We and our bodies are then moved by a greater quality of love which is, as you have shared Sandra, our natural way of being. Our lives are like our homes, any clutter and excess in either affects the function of the whole. There is a gorgeous part in here about claiming back the courtyard and what it stands for. This is gorgeous because it shows that you understand how nothing is in isolation, all things are connected, and by this we can always see the truth of our relationships being reflected back to ourselves through every part of life, even from a courtyard. Thank you Shami, I appreciated how you shared that nothing is in isolation and everything can reflect something back to us, and in the case of the courtyard an opportunity for healing. At first glance it, may not be obvious that the ‘state’ of your courtyard was linked to your withdrawal from life, but it makes sense that everything is linked to everything else. Letting untidiness build in my house is definitely a reflection that I am not ‘on it’ at home and that disorder for me, is a reflection of being under pressure and in overwhelm. 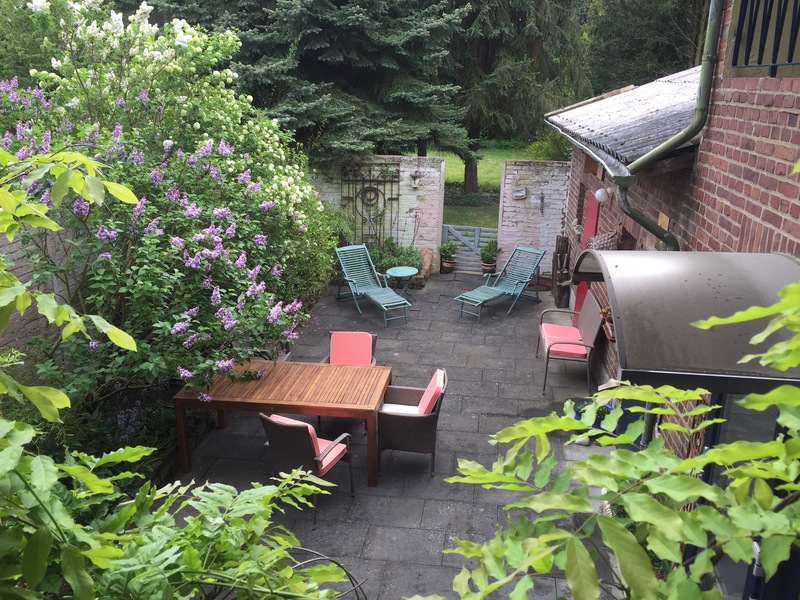 It is an amazing process claiming back that which we haven’t used for a while, no matter what it may be, and I love how claiming back your courtyard just wasn’t about the physical work but what unfolded for you on an inner level. I am sure we all have things in our lives that we have allowed the ‘weeds’ to grow in and the ‘mud’ to cover but once we have made the commitment to clear out all that does not belong there the process of rediscovering what is there waiting for us can be quite magical. A great sharing that goes to prove that everything affects everything else. It is all one and we cannot have one little pocket of undealt with hurt without it affecting every aspect of our lives. All space is sacred and its up to us to claim that space, Every part of a home deserves to be filled with love. What a brilliant observation/realization Samantha! YES – all space is sacred and so it is on me how I honor this space/sacredness….or not. What a reflection for me, if I do not so. And what a potential for all of us, if I do. Beautifully put Samantha, “All space is sacred..” it’s there for us to claim and as you say allow it to be filled with love, a love that is already there. ‘The moment I withdrew from someone and/or life – I am in fact withdrawn from my natural way of being.’ I had been feeling this acutely recently and then I chose to clear out the laundry/boiler/shoe/freezer room. This is how everyone enters my house and for some time it had been bothering me that lots of things were crammed into small spaces, hidden, or mostly hidden, from view but there nonetheless. I took everything out and thoroughly cleaned everywhere and then sorted all the bits and pieces, discarding some and organising others, interestingly the man who services the boiler came during this period and we managed to make a little space for him to overhaul the ancient machine that creates the spark that fires up the heating for the whole house. Now it is a joy to walk through the door and, just as the weather turned cold we could appreciate even more the boiler and the man who keeps it’s workings clear and free from blockages. I feel the freedom of my expression returning too and a motivation to communicate. Thank you. I feel totally inspired by this and love the parallels that you are sharing, emphasising to me that everything matters and all areas of our life have an impact on the others and to not let ourselves fade into insignificance through any of them and how wonderful it is to breathe life into something we have been ignoring. Love the term ‘breath life into’. Yes, we are surrounded by potential and if we honor it and activate the potential of love in every part, we all will blossom up. Since moving into this house three years ago, it was not until this year that I have actually paid any real attention to the garden, and seen it as part our house that deserves to be loved and cared for. I was inspired by a neighbour who was selling his organic produce to trim things back a bit, and the plants that I have tended to look so much more healthier, shiny and spacious. Oh yes, it is a joy to make this experience – to step beyond the area we feel comfortable/safe with. A world full of space (true light) is waiting for us to be discovered again. So beautiful Sandra – today I stepped out more than I have before, embracing people and myself in a whole new way. But I feel it’s important to understand that’s it’s not an overnight thing. We really have drifted so far from the Love we are. So to return takes dedication, persistence and time. But when we embrace this process with true care and togetherness – it is like we have already won. Thank you Sandra, you help us see so clearly that it’s not enough to dismiss an issue, to brush it off, to briefly discuss and then move on. If we don’t truly stop, connect and commit together to understanding what happened and feel why it hurt, we let it seriously erode the joy and love that we are. The way you and your husband came to see this eventually and heal the situation so beautifully, together is a huge inspiration to me. You remind me that we are custodians of our homes not owners. We have a responsibility to use whatever space we have in a loving and nurturing way. This is a great blog for me to read at this point, a few months a go we had people move out of our flat which has left us with a bathroom and spare room we are not used to, from reading your blog I can feel my partner and I have not claimed the space back for us. There is something about claiming your whole home, that is about how much you claim yourselves in life. Thank you Samantha, I had never considered this, lots to ponder here. It makes such a difference when we make it just as important as anything else any area of our life and give it as much Love and attention that it deserves. Thank you Sandra, I loved what you have shared claiming back your space and opened up to each other and the world. I have a garden that is is need of loving care, I used to love working in the garden but I put it first before me, now that I am learning to be more loving and caring with myself its time to bring this love and attention to my garden, clean up this lovely space and invite people over to share. Sandra it’s been a while since I have read your blog and I feel truly blessed by the insights and healing I have received again. I realised today reading how I have given up on some parts of life because of hurts, when in fact my natural expression is joy and to engage with life. You have given me a lot more to consider and look at – I may be back soon for another read. I have a very sad and abandoned balcony. I loved it dearly when I moved into my home. It overlooks a veritable forest of beautiful trees. Birds play and dance on its railings. I used to sit there in summer and read books, or soak up the sun on beautiful sunny, winter afternoons… but a very difficult work situation changed that. A low grade state of fear, worry and fretfulness about the future set in…and took over. Incredible how that happens. Sandra, you have inspired me to get out my steam cleaner, scrapers, sugar soap..chuck out the pots that do not work, repaint the concrete and pot some beautiful plants. Amazing sharing Rachel! If we see our surroundings as a part of us – how would it be to say something like: “I have a very sad and abandoned chest.” We allow things to come down, as we have allowed the world to come down. Now we claim it back – every part of our bodies, houses, gardens and the whole world. The world (and I mean: relationships all over) has to blossom – because its meant to be like that. Thank you Rachel and Sandra, we allow the negativity of the world and our reaction to it to push us back, we literally withdraw away from ourselves and our outer world reflects this. Time to claim it back! I love the messages here that holding on to any hurt even if it seems insignificant and closing our heart in protection to any degree have an impact on every aspect of our life. And also that life constantly gives us pointers to the next step for us to reclaim living in full. It’s amazing how if we leave just one thing unaddressed in our life – the enormous effect it has on us, and we don’t realise how big that effect is until we address it and it feel so much better. It’s great to address things straight away and not leave those little pockets or areas undealt with, after all, we are just delaying something we will inevitably have to do one day. There is such an important message for us all in this piece – that when we have a hurt that we perceive another having done to us, we contract, go hard, into protection and then withdraw from life. Sometimes only a fraction but even this is enough to seep into our being and affect our movements further down the track, until one day we look up and see we have let our garden become choked with weeds because we have denied ourselves the beauty of a heart in full bloom. Very beautifully said Liane. You remind me that we often withdraw in resentment, wanting others to ‘pay’ but we are the ones that pay the price for the choice to withdraw. There is much to learn from in this blog. I can see the tendency I have to want someone else to clean up my disregard of spaces in my home. It is also very true for all of us that we can think we have dealt with a hurt but find that we dealt with 80 or 90% but are secretly clinging to the extra bit. To see the flow on effect on your relationship and the care and openness in your home was a great lesson. I think we kid ourselves that a little secret hurt won’t hurt anyone but in fact it has a big ripple effect and stunts our evolution. This blog has offered a truly amazing way to look at life because when a hurt has still got a hold on us it is reflected through our choices and our home, garden and office environment. We might tell ourselves it’s dealt with but our life and body can certainly reflect the truth back to us. And great point about clinging on to just a little bit of that hurt and feeling it doesn’t make a difference because it’s our secret, when in fact it’s having a big effect still. It’s similar to clutter, we hang onto something that doesn’t serve us and lowers the energy of our environment. Yesterday I sorted out our back garden. I cut the grass, swept up and took some junk I had been storing there to the recycling dump. Even though I cant see our garden from the house, it feels great to have done it and I feel a lot lighter. It is interesting that your place of neglect was also one of the places of repose and enjoyment together Sandra. What a symbol! Too much going on inside you both with the old held hurt which keeps you in motion and avoid addressing it. To claim your courtyard back with all its vibrant plants for growth and vitality, and clean all the old stuff off the floor — your foundation, is the work we all need to do inside us that then allows us to clear the space and meet together to enjoy the beauty of ourselves, each other, and the natural world. How often do we as humans begin to keep others at a distance, protecting ourselves from becoming intimate, simply because one other person has hurt us? We seem to be so determined to hang on to this hurt and protect ourselves in all manner of ways just in case we get hurt again and so doing the walls around us get even thicker. These walls not only keep people out they keep us shut away from a world that needs us to be in it so everyone misses out. Maybe if we let the hurts go and dismantle these walls we may be very surprised at what happens next. It is interesting isn’t it how we have to stay aware of areas in life which might have been or seemed to be going well but we need to keep an eye on them, as things can change like a patch of mould forming in a corner if we neglect our energy there and with what that represents in our life. Our whole life and everywhere we live it not just our homes, translates back – everything is everything and we need to stay vigilant. Claiming back the responsibility in our natural expression of closeness and intimacy is such a deep joy, claiming this in every area of our lives is saying naturalness is our way of life. Sometimes, we can feel amazing inside our homes, where everything is nurturing and supportive. The key is to take this out in to the world and show your care, be this expressed by the way your garden is tended to, or how you move on to a bus, or even simply how you breathe. Taking yourself out in to life is what makes us all stop and re-consider just how loving or caring we have been and if this needs to change, it is just about asking or presenting the question, as we will all get it and this is what supports us the most with your loving ways. I have focused very much on the inside of our home since moving here two years ago. Its easy to ignore the outside parts because I am not looking at it a lot of the time, but just because its not visible does not mean I am not aware of it. It’s like that messy room we can keep the door closed on, or that untidy drawer we don’t want to bother sorting out. Ha! I know this attitude Debra in many ways. The try to ignore what I am aware of anyway. I can use therefore food, busyness and …everything at the end, just to deny what I feel and know. But why? It is asking me to take responsibility and I become more clear about: with everything I choose to become aware of and not ignore it any longer, I get a bit more of life and its possibilities. In fact it is a great gift to expand my awareness and responsibilities – it expands my life as well. I have been blown away continually by what Universal Medicine presents about the hurts we hold, as before I came across this I would have had a handful of hurts that I knew of and that would have been pushing it. So to come to a realisation and feel the many hurts that I had been walking around with and how this had created layers and layers of protection I can now see that this kept everyone out and myself at a distance with myself also. Healing these hurts and letting them go has been incredibly freeing and now I can feel when this protection goes up and am ready to keep looking for any unresolved issues that I have been holding onto – you’ll be surprised how many there are! It is like we actually enjoy having them because we think it keeps us safe instead of being totally transparent, but it comes at a cost. Yes. To protect ourselves has its costs. And when it is on us to pay for it we blame others for what we did end up with to try to avoid to pay. But to pay we have to. This is called Karma – and it is a blessing, as it empowers us and does not let us out of responsibility. This is true love and the representative of who we are in truth: divine energetic beings. If we re-connect with this fact no protection is needed. Yes Natalie, you raise a great point here that having felt the lightness that comes after dealing with a big hurt, we have to be prepared to review what is next to be dealt with, as it seems the hurts are many fold, and taking them off becomes a way of life that is on-going. And, if we are not full-of-care we can find ourselves adding hurts along the way too. A great learning for me is never to get complacent that these things are dealt with, but be curious in exploring if I can see that, what else can I see?